Now researchers from Clarkson University in Potsdam, New York, say they have come up with a mathematical formula that could slash flight boarding times – with the amount of hand luggage passengers carry proving to be a key differentiating factor. They argue that allowing passengers with more carry-on bags to board flights first could cut the time it takes to complete boarding, and save airlines an annual sum of up to $10million (£600,000) in costs associated with delayed flights. The method proposed by Professor R. John Milne and undergraduate student Alexander Kelly would see passengers profiled by the number of bags they are carrying, with those with the greatest number of bags called out to be seated first. These passengers would then be placed in a window seat so that they don’t need to get up each time a subsequent passenger boards. The method was put the test by Mr Kelly, a computer science and mechanical engineering dual major from East Greenbush, N.Y., by running thousands of simulated airplane boardings through a computer model. 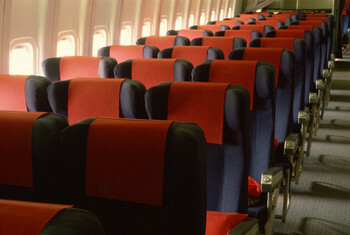 When compared with boarding at random the researchers boarding method is said to be around 25% faster. To help ensure your travels are stress free, it is important to organise travel insurance cover in advance.